The Tennessee trio, fronted by Hayley Williams, are celebrating after their self-titled fourth record knocked Justin Timberlake off the top spot in the US and she admitted that she is still pinching herself over the album's success. "This is one of those things that happens in the movies. I feel like we are living out some storyline that I have never imagined would be our own," she wrote to MTV News. "This is like when I watched the Temptations movie or That Thing You Do a million times as a kid... And wished every time that I could be doing that. I never thought it would be us." 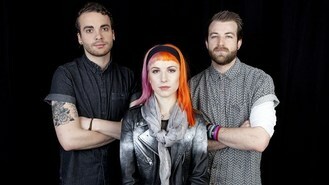 Hayley said they couldn't have done without their supporters. "For the three of us, it means we did something right! More than that, it means us and our fans have grown up and we've done it together. Not only were we ready for something different, but obviously they were ready for it too. That is truly the most humbling part of the whole deal," she continued. "It's amazing they've stood by us. I know for a fact we wouldn't have a number one album if it weren't for how dedicated our fans are. They just made history for us."